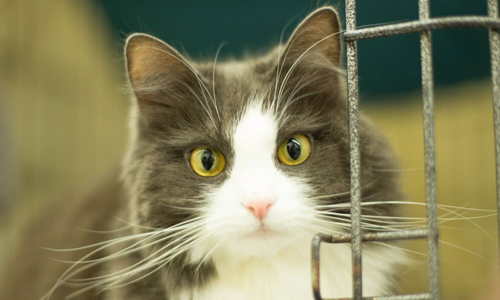 At VOKRA we believe all cats deserve to have a safe and happy life, regardless of their challenges. We often see and hear about all the cute and cuddly kitties, but never about those who show a little less affection or need a helping hand. Now, the spotlight is on some of VOKRA’s long-term care cats – Charlie, Jorje, Charis and Ashlay. 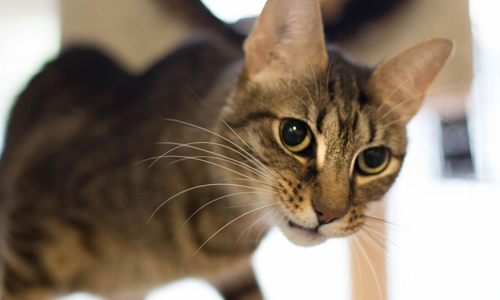 Charlie’s an 11-year old tabby who is in palliative care at our Operations Centre. He was adopted in 2007 and, while a loving cat to his family, Charlie wasn’t very tolerant of visitors and other animals so he was surrendered to VOKRA in 2016. When he arrived at our Operations Centre, our volunteers found it hard to feed him and clean his kennel as he would often attack. He was then moved to a larger room to allow space for us to slowly work with him and gain his trust. Charlie was on a strict diet as any change in food would cause vomiting. He was sent to the vet for bloodwork and x-rays, but nothing was found that would be the cause of his trouble. Finally, an ultrasound revealed a two to three inch tumour between his liver and pancreas; the thickened intestinal wall indicated lymphoma. Charlie’s now on daily pain medication and is fed high quality wet food four times a day with supplements to help sooth his tummy. While he still has some anxiety, he doesn’t attack as often, most likely because his pain is managed. He has a room at the front of our Operations Centre where he can see outdoors and lay on his heated blanket. Due to unpredictable behaviour and essential daily care, Charlie will live out the rest of his days at our Operations Centre, monitored by our medical team and with the company of our experienced volunteers. Jorje is a 12-year old cat who showed up crying in the rain back in September 2016. 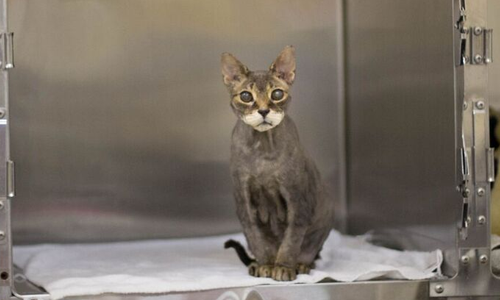 He had hair loss, rotten teeth, severe dermatitis and was starving. VOKRA took him to the vet, where they found he has moderate kidney failure, at first requiring fluids twice a week followed now by medication to manage. While in foster care, Jorje was found to have ringworm, a persistent skin fungus, and was brought back to our Operations Centre for treatment. There, he caught a bad cold and at one point he had painful ulcers on the corneas of both eyes. While nursing him back to health, our volunteers found Jorje also has food allergies which we manage by a raw diet of either bison or beef. Likely because of his allergies, Jorje also frequently suffers from ear infections. Jorje stayed at the Operations Centre until October 2017 as his ringworm was particularly difficult to treat. No oral medication was allowed due to his kidney issues, leaving the ringworm to be treated through bathing with a special anti-fungal shampoo. His ringworm kept moving around his body, so we resorted to shaving him to help manage and it seemed to work. Jorje is currently doing well at his foster home and may one day be adopted into a caring and loving home. Charis was surrendered to VOKRA in November 2016 as she became nervous when the family baby began to move around the house. The family also couldn’t afford to spay her and she was already two years old. She doesn’t like other cats and was very aggressive on intake; it tooks months for her to settle down at our Operations Centre. Charis has had five different fosters and the last two returned her for suddenly lashing out. Since October, Charis has also had major hairball issues, along with diarrhea and constipation. She hasn’t been eating well and seems depressed, but is now on a natural anti-anxiety supplement. After coming back to our Operations Centre, she’s calmed down in her kennel as she seems to acknowledge it as her home after having spent so much time there. 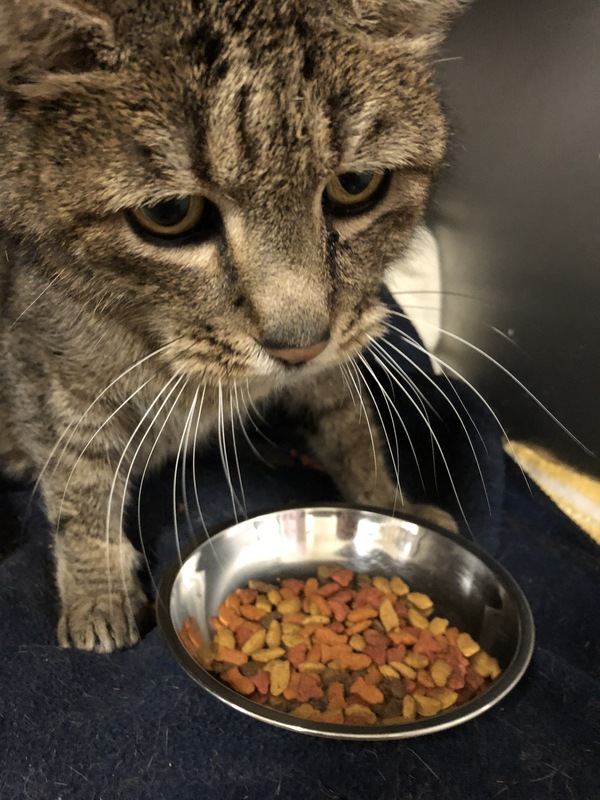 Charis needs a foster home with no other pets or small children, along with a small space to call her own while she calms down and settles into. She needs a patient person who will learn her fears and work with her to overcome them, before the possibility of being adopted. Ashlay is a 2-year old cat who came to VOKRA as a stray with three young kittens in December 2016. 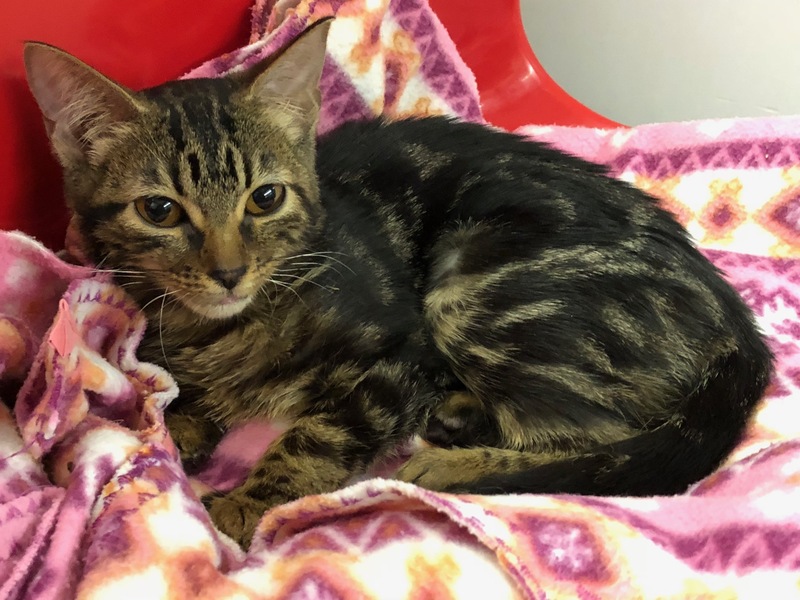 She was fostered with her kittens for three weeks until she was returned to the Operations Centre for behaviour issues; Ashlay would bite when the foster tried to pet her or clean her litter box. Her second foster worked with her daily to encourage positive interactions and discourage biting. It seems she bites when she isn’t receiving what she wants, whether it be attention, food or playtime. 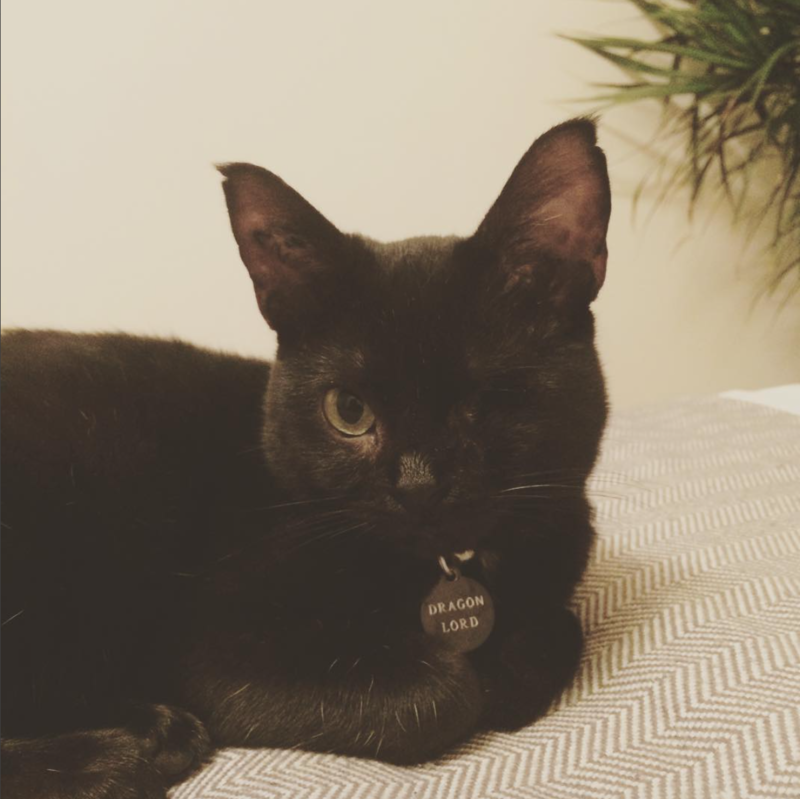 Due to her difficult nature, she’s been waiting for the right foster home since July. 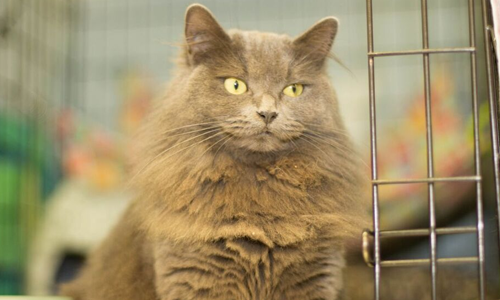 She may do well with a buddy cat to keep her busy, or she needs somebody who can establish a routine with her that includes plenty of exercise and playtime. 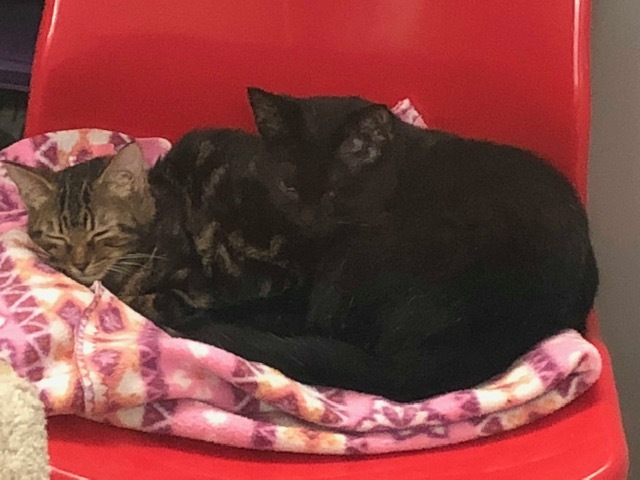 While our long-term care cats require close monitoring and daily training, we’re confident they have a loving future ahead of them, if not with a foster or forever family, with the devotion of all our volunteers. At VOKRA, kitties will always have a home until their last days. If you think you may be the right person to either foster or adopt one of these special cases, please visit our website at www.vokra.ca or contact us at info@vokra.ca. If you’ve ever wondered about VOKRA’s origins, you wouldn’t have too look far – it’s right there in our name, specifically in the O and the K, which stand for “Orphan Kitten”. Founded because of kittens that were orphaned and without moms, VOKRA began as a means to provide crucial care that would replicate the feeding and love a mom cat would normally provide. Though bottle feeding kittens may sound like it’s all purrs, cuddles and explosions of cute, considering that most litters reach upwards of five, it’s no small feat. Newborn kittens require constant tending to and must be fed every two hours. They have to be kept warm at all times through the use of blankets and heaters, they need to be burped and bathed, and you must stimulate their poop and pee. Basically you need to replace their mom in every way possible, short of becoming a cat yourself. Many years ago, VOKRA founders Karen Duncan and Maria Soroski were volunteers at the SPCA when litters of kittens kept coming in without moms. They quickly learned how to bottle feed and fielded requests for their services up to twice a day during kitten season. If you’re picturing an actual orphanage filled with rows of cat beds and endless litters of kittens, you wouldn’t be far off. At times their own beds were piled high with kennels full of kittens requiring 24-hour care. Eventually, Karen and Maria branched off on their own and realized the reason for all the motherless kittens was that no one had figured out how to trap the feral moms. Once they began trapping them, the need for bottle feeding was greatly reduced. While keeping kittens with their mom is always the preference, bottle feeding is at times a necessity. Sometimes it may only be for a short period, temporarily feeding them until their mom is located or merely helping a mom cat with her extra large litter. Other times we may be able to use surrogate moms instead, adding orphaned kittens to another mom’s litter. We trap feral moms whenever possible, using the scent of her kittens’ urine or fur to lure her in. But in cases where the mom is never found or has passed away, bottle feeding is the only hope of the kittens’ survival. Receiving an average of 10 litters a year that require full-time bottle feeding, we have a handful of dedicated volunteers who provide constant care and attention to ensure these little ones survive. Around the clock care is necessary and some volunteers even take their tiny wards to work. In the past Ellen Keiser, a teacher, took her bottle fed babies to school and fed them during recess and lunch as her class looked on for some firsthand lessons in cat rescue. At times, volunteers share the duties between them, “babysitting” if one of them needs a break. Even with the best possible care, survival rates are a bit lower for bottle fed kittens. They’re more prone to illness and not all of them make it. 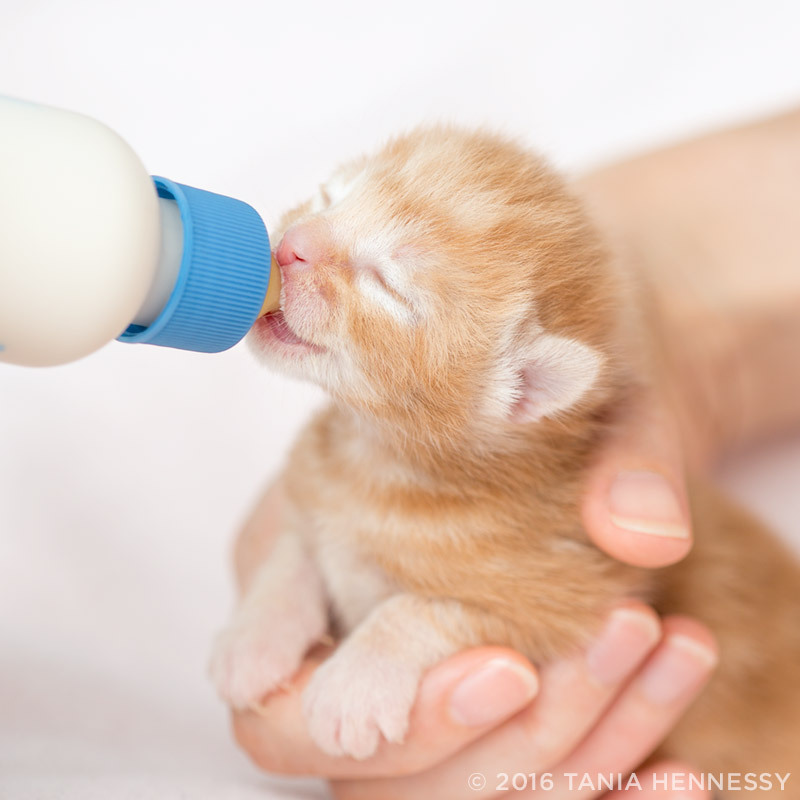 To be a bottle feeder volunteer requires not only time, patience, flexibility and the ability to do without sleep, but also the strength to handle the potential for heartbreak. Says Ellen, “You need to prepare yourself for the loss, but also for the celebration that so many do make it due to your efforts.” Last year, foster mom Tania Hennessy cared for more bottle feeders than she ever had before and says she becomes especially attached to them. For her, watching them grow up and find their forever homes is worth the undertaking. Bottle fed kittens sleep a lot and after two weeks you can begin to train them to use their litter boxes. Eventually you’ll find small puddles of poop, which to a seasoned cat rescuer like Karen is “quite exciting”. As the kittens grow, they become among the sweetest and sociable of cats since growing up among humans is all they’ve known. In fact, they consider their bottle feeding human to be their “real” mom. Says Tania, “My favorite part of caring for bottle feeders is the day when their eyes open and they finally look back at you for the first time. Paired with the happy purrs of a full belly at 3 a.m., it’s heart melting!” Seeing bottle fed babies transform into active and healthy kittens is truly a reward like no other. As a 100% volunteer-driven non-profit, we clearly couldn’t do what we do without our extremely dedicated and hard working team of volunteers. We’re currently actively looking for cat care and reception volunteers. If you’re interested in volunteering with us visit our website at vokra.ca/volunteer. 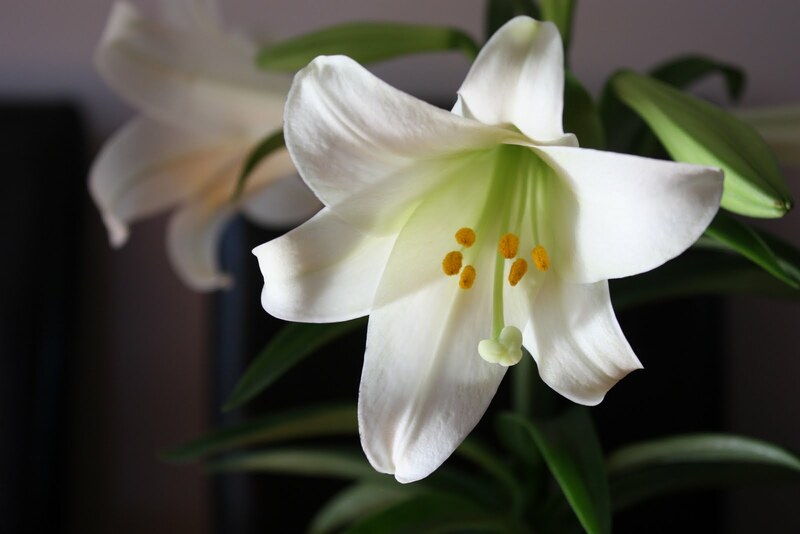 Beautiful and fragrant as many varieties of lily are, they pose an extreme danger to the cats. 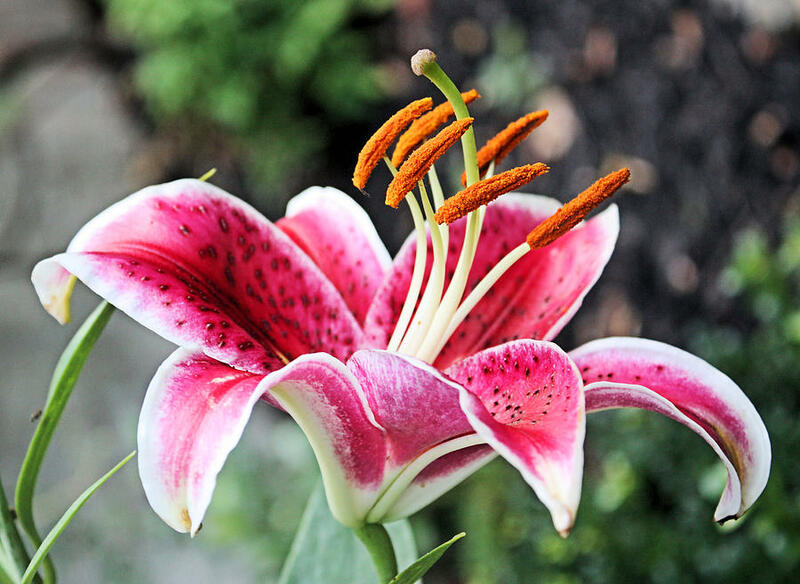 Any part of the lily, even the pollen, is toxic to cats if ingested and even a small amount is deadly. Unfortunately they often come into homes as part of a bouquet or as a potted plant and curious cats will nibble on the leaves or brush near the flower and get pollen on their coat. They may also eat a leaf or flower in the garden and, in either case, they’ll become extremely ill and often die. All this comes from personal experience. My one year-old cat, even though I had her on a leash, managed to mistake a daylily leaf for a blade of grass (they look very similar) and scarfed down a four inch piece while I had my back turned. 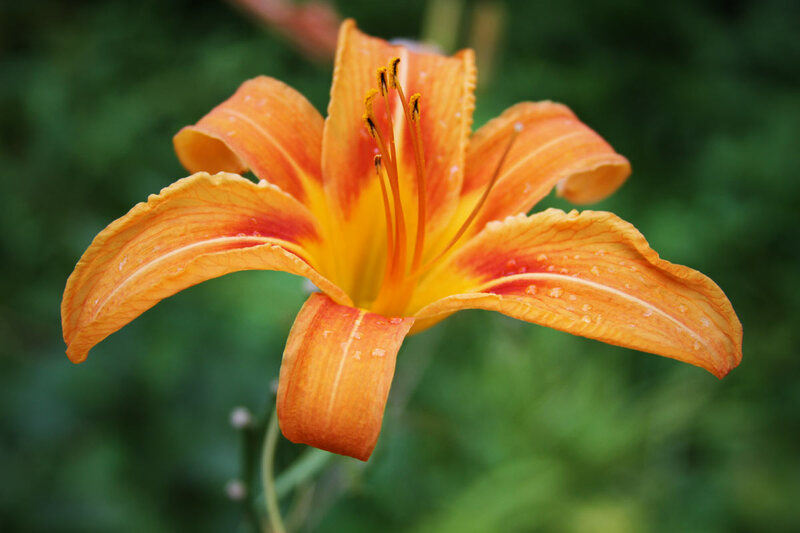 I noticed the fresh bite on the leaf and phoned the ASPCA poison control line to see if daylilies were as dangerous as the Asiatic lily that often comes in bouquets. They told me to get her to the vet as soon as possible as it’s the same class of plant. The vet gave Zena hydrogen peroxide, a treatment to make her throw up. Luckily it worked and we identified the piece of daylily leaf. Even though we removed the poisonous item they told me that even a trace of this poison left in her stomach could destroy her kidneys, so she would have to spend at least 48 hours at the emergency clinic being constantly monitored by a vet and technician. They kept her on a constant IV drip with fluids to help remove the poison and hopefully stop it from destroying her kidneys. She seems to have recovered without any ill effects, but the vet cautioned there are no tests that show kidney damage until there is only 25% of the kidney functioning so she still could have damage that will compromise her kidneys later in life. He said we were very lucky as usually they don’t see the cats that have ingested the plant until they start showing symptoms and often there is no help for them. The most common symptoms are vomiting, anorexia and depression or lethargy. Less often hypersalivation, twitching and hyperthermia are seen. Signs of renal failure are usually seen within 24 hours. As little as one leaf can cause a fatality. Using Diuresis (increasing urine production) helps to eliminate what is left in the system and limit damage to the kidneys. If the treatment is not started within 18 hours the prognosis is very poor. Unfortunately the cat may not arrive at the vet’s office within this time frame and it will be probably too late for effective treatment. Indoor cats may be a greater risk as they may not have access to greens indoors and will be interested in any plant material, though they do prefer grass. 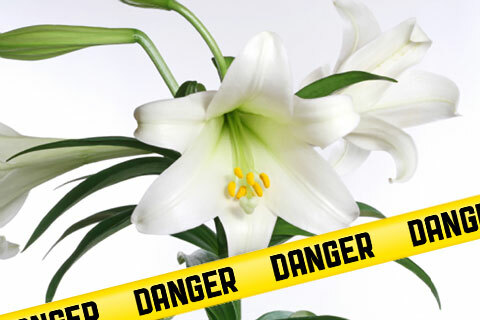 Some examples of lilies that are nephrotoxic to cats are: Daylily (hemerocallis), Asiatic Lily (Lilium asiatic), Tiger Lily (Lilium Tigrinlum), Easter Lily/Longiflorum Lily (Lilium loniflorum), Stargazer Lily (Lilium orientalis), Japanese Showy Lily (Lilium hydridum), Rubrum Lily (lilium rubrum) and Western or Wood Lily (Lilium umbellatum). This is not a complete list as there are many varieties of lily. The ASPCA Animal Poison Control Center’s phone number is 1.888.426.4435. Their poison hotline is staffed by veterinarians and operates 24 hours, 7 days a week for information and instructions on what to do if your pet has ingested plants or substances that you suspect may be poisonous. At the present time there is a charge of $65USD for a veterinarian’s advice. Their poison control website has a list on toxic and non-toxic plants, poisonous household products and more here. Statistics show the average lifespan of an indoor cat is 12-20 years compared to only 1-5 years for an outdoor cat. This is why at VOKRA we firmly believe keeping your cats strictly indoors will lead to a long, healthly life for your beloved pet and fewer worrisome nights and vet bills after a cat goes missing, is injured or even worse. Many cats love to stay indoors and are never happier than when padding around the house. Yet sometimes your cat may become less content, which can be distressing both for you and your pet. When a cat isn’t 100% happy they can show it in a number of ways. For example, your cat may become ill or simply more lethargic than usual. It perhaps doesn’t surprise many of you that your cat likes to be in control! And when they don’t feel in control in their environment this can lead to unhappiness. One simple way you can keep your cat comfortable in its environment is by keeping to a routine in your interactions with them. This can be by feeding them at the same time each day and even by trying to play with them at the same time. Cats also need their senses stimulated to keep them happy. While many readers will already use catnip, there are also a number of other herbs that could provide a little interest and variation for your cat. For those of you whose cat isn’t partial to catnip, cat thyme may prove a useful substitute. Enriching your cat’s life with toys is also a fun way to keep them happy. Unfortunately this can get expensive as cats tend to grow bored of toys pretty quickly, so why not try to enrich their lives by making some easy to create toys and puzzles? This is a great, cheap way of adding variation to your cat’s day to day life. Keeping Your Cat Happy Indoors by Terrys Fabrics.